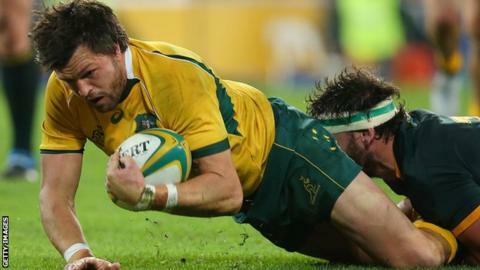 Australia scored a late try to beat South Africa in their opening game of the Rugby Championship in Brisbane. Adam Ashley-Cooper crossed to put the hosts ahead in the first half. Scores from Eben Etzebeth and Jesse Kriel, plus four Handre Pollard kicks, gave the Springboks a 13-point cushion. But the Wallabies fought back in the final 10 minutes, with Michael Hooper crossing before the television match official awarded Tevita Kuridrani the winning try. New Zealand beat Argentina 39-18 in their Championship opener on Friday. All four teams return to action on Saturday, 25 July, with South Africa hosting the All Blacks before Australia's game in Argentina. This year's tournament is reduced to three rounds because of the Rugby World Cup in September.